involved in making the mural happen. All in all, it was a great opportunity to express our communal pride. We always knew that we wanted to have some sort of graphic on the front of the annex. We knew that we were going to have to close in the front for security reasons, so that area would lend itself to some kind of graphic. About the time we were thinking about what could be placed on the front of the annex, we received a call from Judith Nicely about wanted to do something in honor of her parents—Stanley and Helen Bowers. We suggested a mural could be commissioned that would depict some of the items in the museum. Judith and her sister, Mary Jo Pi, indicated that they had a stain glass artist in northern Ohio that they would like to use. We sent the artist some information about the interesting artifacts in the museum and she developed a 7 panel design that could have been back lit. Unfortunately, the artist ‘s husband was killed in a tragic auto accident and she was not able to contract for the work. We asked local muralist Eric Henn if he would consider designing and painting a mural. He was interested, but his other commitments made it nearly impossible to schedule the job. We opened it up for other artists to submit ideas, but none of the ideas or work submitted was of a quality that was satisfactory to Judith and Mary Jo. 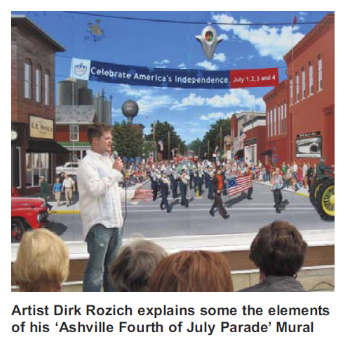 In the meantime, Diane Hines was reading about this exceptional young muralist, Dirk Rozich, in the Ohio Magazine. He had completed a rather whimsical outdoor mural in Sebring, Ohio at Schreckengost Park. Bob Hines showed the work to the sisters and they agreed that Bob should pursue engaging Mr. Rozich. 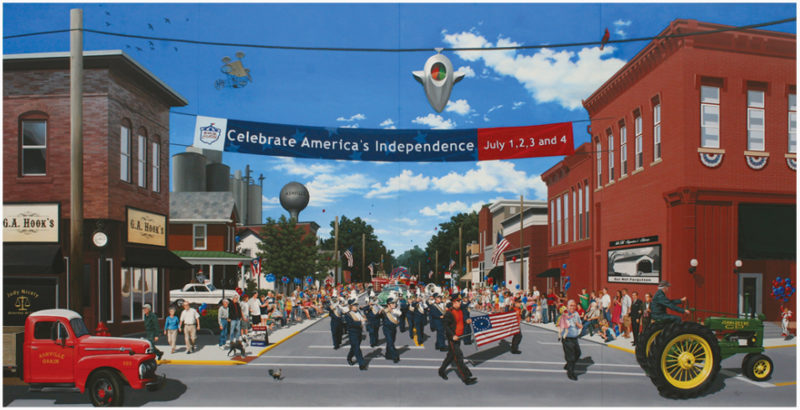 Bob and Dirk worked together to develop a theme and ways to incorporate local history into the mural. Dirk was keen on placing hidden items of interest and special meanings in the mural. Dirk further developed the concept drawing and constantly checked with Bob on alternative ideas. Judith and Mary Jo approved the almost completed concept drawing and Dirk built a special framework to hold the work in his basement while he began the long and detailed painting process. The brickwork on the the old Hook building was extremely difficult to reproduce, but he managed to do it. He also managed to insert some local people, even though Judith and Mary Jo did not want identifiable local people placed in the mural. Dirk made the decision to incorporate Stanley and Helen Bowers, as well as people who had helped him design the mural and ready the location of its mounting. He included Charlie Morrison, Bob Hines, Charles Cordle and Joe Dean from Ashville, without their knowledge. He photographed the Teays Valley H.S. band and used them in the scene, as well. When it was finished, Mary Jo and Judith were thrilled with the result and were happy that Dirk did not listen to them. 1. They wonder why Jack Lemon was not featured in the mural. The same could be said for Marguerite Browkaw, Art Deal, Herman Petty, Chet Gloyd, Bronson Kitchen, and many others. Dirk decided to symbolically represent all of these important contributors to local history as balloons floating up into the sky. 2. Many have also commented that the parade is going the wrong direction and never came that direction. The artist did this for the effect, not for historical accuracy. Never-the-less, people who make that claim are wrong. The parade did indeed travel down Long Street going south during the first years of the Fourth of July parade as documented in photographs.